Easily create interactive markers from yaml files. 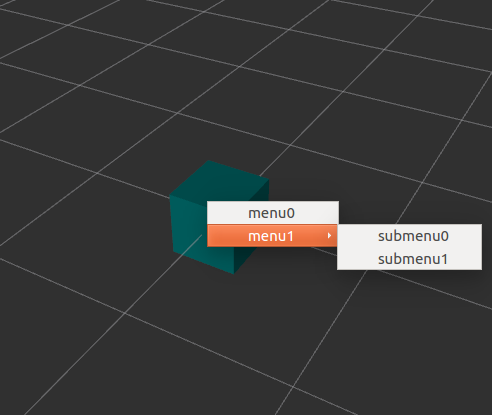 You can create a box with a menu by creating the following setting file. Please execute the following command. Or the following commands are publishing the configuration. It is possible to use several tags in the configuration file. This tag includes the written configuration file and expand the contents. This tag expands the enum variable of the specified message module. This tag converts euler xyz angle to quaternion. This tag converts degrees to radians. Some subscribers are added when generating a interactive marker. Keep the interactive marker's name and update it using InteractiveMarker message. Update the interactive marker's pose. Add InteractiveMarkerControl to the interactive marker. Delete matching InteractiveMarkerControl with InteractiveMarkerControl.name. You can specify several commands to be executed when menu is selected. In the following example, the string "hello" is published to the topic of "test". Please also see this example. In the following example, "add_two_ints" service is called. Please also see this example. In the following example, python function is called. Please also see this example. You can create grouped checkboxes. In this case, menu0 and menu1 belong to group a, and submenu0, submenu1 and submenu2 belong to group b. Check boxes are controlled exclusively within the same group.